It’s always worth having a cable sniffer in your toolset and Fluke makes a decent device in the Pro3000. 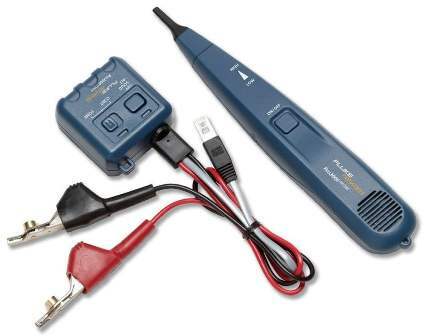 This simple unit can detect faults in anything from CAT5 computer network systems to coax, phone lines, speaker cable and mains (non-live) wiring. Fault finding is especially fast and productive in looms of cables. Fluke Pro3000 pluses: high volume output to easily discern testing in noisy environments; five distinct tones (for isolating pairs); signal distance up to 10 miles; checks continuity and polarity. For around $70, the reliable and well built Pro3000 is a good deal by Fluke. Multimeters are an essential tool for an electrician, primarily for testing live (energized) circuitry. A tone generator primarily troubleshoots dead (de-energized) circuits and can greatly speed up the process when faced with a large number of cables. They can diagnose all sorts of cabling systems, from mains wiring to data systems pairs, though chiefly the latter. What can the Fluke Pro3000 be used to test on? : Electrical wire (disconnected from supply), coax, speaker wire, CAT 3/5/5e/6 data cable, security wire. Also good for setting up patch panels. Process: The tone generator ‘injects’ a constant or alternating tone into a pair of cables, after which a probe is used to pick up the corresponding noise somewhere along the run. With the Fluke Networks 26000900 Pro3000 Tone Generator, you can have it generate up to five different tones in order to differentiate between separate pairings to cut down on time. The probe of the Fluke Pro3000 has a speaker for increased volume, the level of which can be adjusted. You can also plug in headphones via the 3.5mm jack for especially noisy settings. This probe will trace the tone through a variety of barriers, including various sizes of drywall and wood shuttering. It will also work when accompanied by spurious electromagnetic interference. The RJ11 phone plug allows users to quickly check phone lines. The included bed-of-nails clips makes connecting non-terminated ends to the generator especially simple, automatically biting through cable insulation to the core. Just clamp the one end and wand your wire runs. When you hear the beep, you’ve got your cable. The plastic probe tip means you won’t end up shorting any metallic patch panels and the like. Tip: For pinpointing the other side of a wall; simply tap through a nail, connect up the lead of the generator then wand the other side. Total travel length: As much as 10 miles for a 24AWG twisted pair and two miles for SmartPhone signal. The included RJ11 plug will also work for RJ45 jack sockets in un-terminated pairs. It is best to pick up the Fluke Networks Pro3000 and Probe Kit as you get the tone generator, the probe and the bed-of-nails /RJ11 cord. Other features: To save digging out the trusty multimeter, the Fluke Pro 3000 also comes with a handy continuity checker. In addition is a phone line checker with LED indication, to check for correct polarity. It is powered by 9V batteries (not supplied). A reliable and well constructed toner and probe, the Fluke Networks Pro3000 is up to Fluke’s general standard of design / build, with a tough casing and nice leads. It features sure buttons and switches and can take some abuse in vans and tool bags. You can buy them cheaper, but Fluke has produced a strong toner and probe product here. User interface: Controls are basic on both the tone generator and probe. There’s an on/off button on each, a volume dial on the probe, and a sliding switch on the generator for tone and continuity. A sliding switch and corresponding push button offer up solid and alternate tones. LEDs denote tone mode and continuity modes. Along with the test leads output is a 3.5mm earphone jack input. The Fluke Networks Pro3000 is one of the best toner kits in the business for troubleshooting data lines and phone networks. It comes with a loud, multipurpose toner & probe that will work over miles of cable on a variety of systems. A well built device with the Fluke badge available for a fair price. The Fluke MicroMapper is also worth a look.